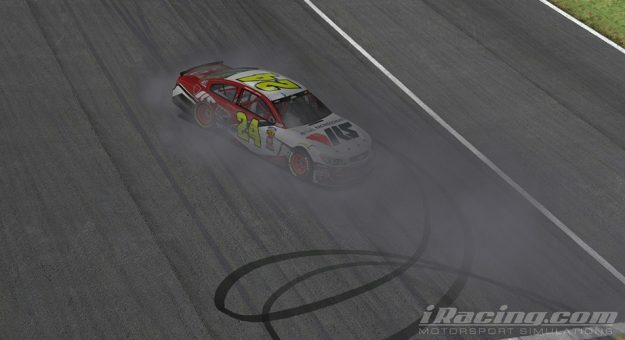 Keegan Leahy continued his stellar 2018 NASCAR PEAK Antifreeze iRacing Series season by winning at Kansas Speedway after passing Logan Clampitt for the lead with eight laps to go. Ray Alfalla continued his hot start to 2018 by finishing second while Nickolas Shelton was third. Zack Novak led a race-high 72 of 167 laps but faded a bit to come home fourth. Veteran Chris Shearburn completed the top-five finishers. Notably absent from the top five was Ryan Luza, who sat out Kansas for an unknown reason. Clampitt, who started on pole and led 51 laps, was on a different strategy than the rest of the field but ran just short of making it to the finish on fuel. To make matters worse, he spun and hit the wall when making his stop, relegating him to 27th at the checkers. The night started with Novak quickly making his way to the front from sixth position on the grid. He sliced through the top five and passed Clampitt for the lead on Lap 5. Novak threatened to pull away but a crash involving Michael Conti and Bobby Zalenski, both who entered the race inside the top five in the championship standings, slowed the field. Conti could not continue and finished 34th but Zalenski soldiered on with damage and brought his car home 24th. Despite having the No. 1 pit box, Clampitt could not beat Novak off pit road as the No. 15 car continued to pace the field as the second run played out much like the first. Though Clampitt started to reel Novak in during the later stages of the run, the second caution brought the leaders back to pit road with Novak comfortably ahead. Novak won the race off pit road once again and sprinted out to a lead for the third run in a row. This time, however, company would be coming. Leahy, who had the better long-run car, caught and passed Novak on Lap 73 to take the lead for the first time. Just four laps later, Novak fell into the clutches of Shelton as his sudden freefall continued. By Lap 82 he sat fifth with an ill-handling car. Back at the front, Leahy headed to pit road under green on Lap 87, dragging Alfalla with him. Leahy quickly cycled back to second position followed by Shelton and Alfalla. Clampitt, the only driver seemingly trying to make the race on one stop, remained on track in the lead. When Clampitt surrendered the lead to pit on Lap 105, it was clear he had little chance of making it to the end without stopping again, putting Leahy in control. On Lap 126 the top three all made their final pit stops, with Leahy nearly speeding on entry as he locked his front tires. No driver appeared to gain an advantage in the pits, leaving any passing to be settled on track over the last 40 laps. As the laps ticked down, Leahy found himself in heavy traffic and Shelton, sensing a chance, began to push and close the gap. Unfortunately for Shelton he ran a bit high in Turn 1 and brushed the wall, apparently doing enough damage to harm his car’s performance. Alfalla managed to pass for the runner-up spot with two laps to go, with Leahy well in the clear up front. Alfalla’s second-place finish kept him in the points lead, but Leahy is now second, 22 points back. Luza slipped to third after missing the race, 45 points adrift. Zalenski also lost ground after an early crash but is still fourth and Shelton completes the top five, knocking out Conti. The stretch of fast, downforce-heavy tracks continues for Week 7 when the NASCAR PEAK Antifreeze iRacing Series visits Charlotte Motor Speedway for the longest race of the season. The 200-lap, 300 mile affair is the closest this series gets to an endurance event and with the current state of the tires, expect to see plenty of comers and goers. Points leader Alfalla has amazingly only lead 18 laps this season. Is Charlotte where he will turn in a vintage performance? Will Luza show up and get back to his winning ways? Or can Leahy ride the momentum to a third win in 2018? Find out on iRacingLive when the NASCAR PEAK Antifreeze iRacing Series drivers take on CMS!